Imagine a camera that lets you just point and shoot, and later on, back at your computer, decide on what will be the main point of focus. The Lytro Camera does just that. Using a light field sensor, that replaces the regular image sensor in a conventional camera, it captures the color, intensity and direction of all the rays of light flowing into the camera. It basically captures all visual data that the lens sees, foreground to background, into a digital file that you can manipulate afterwards and change focus points, zoom in, and even shift perspective to a certain degree. What is a light field anyway? It is a function that describes the amount of light faring in every direction through every point in space. Michael Faraday was the first to propose (back in 1846) that light should be interpreted as a field, much like magnetic fields. From a photographic standpoint you could say it's all the individual light rays in a scene. Back in 2004, a team at Stanford University Computer Graphics Laboratory used a 16 megapixel camera with a 90,000 microlens array to demonstrate the concept of refocusing pictures after they have been taken. Adobe has a prototype light field camera that takes three-dimensional pictures using 19 separate lenses. This type of setup allows each lens to focus individually, and the resulting image can then be manipulated to modify focus points and perspective. In 2012 Lytro introduced the first light field camera to the consumer marketplace. As mentioned before, the first major capability of a light field camera is the ability to focus a picture after the fact. Living pictures, as Lytro refers to them, can then be shared online. Friends and family can explore and interact with the living pictures you capture with the Lytro, on nearly any device without having to download any special software. This means they can see that picture you took in Paris; focus on your smiling mug, or the Eifel tower way in the back, or some point in between. They can even shift perspective slightly for an interesting 3-D effect, or zoom in to get a closer look. The first thing you notice when you see the Lytro camera is that it doesn't look like a traditional camera. It's actually a small (1.61 in x 1.61 in x 4.41 in) rectangular anodized aluminum contraption that's sure to turn heads when you're out taking pictures. Very simple design; lens at one end and 1.52 inch back-lit LCD display with glass touchscreen at the other. The LCD display is small by any camera standard, which may bother some people, especially those with big fingers. It has a rubberized grip where some of the camera controls reside (Power button, shutter button and zoom slider). The Lytro camera sports a constant f/2 lens with 8x optical zoom. Having a constant aperture means that if you're interested in manually adjusting the exposure you'll need to do so by modifying the ISO and/or shutter speed via the touchscreen. Nothing to worry about if you're into using the camera in full auto all the time. The Lytro camera comes with a rechargeable Li-Ion internal battery that should provide enough power to take more than 400 pictures between charges. The battery can be recharged using the included USB cable or an optional fast charger. The Lytro camera is available in several colors. The Red Hot model comes with 16GB, enough for about 750 pictures. Retail price of $499. The Electric Blue, Graphite and Seaglass models come with 8GB, or about 350 pictures and will set you back $399. There is also a Moxie Pink 8GB model available exclusively at Target. 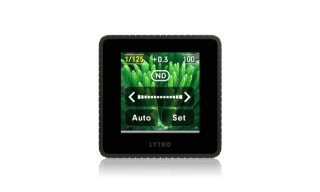 The Lytro camera includes a free desktop application for importing, processing and interacting with living pictures. The software requires Mac 10.6.6 or higher or Windows 7 (64-bit only). Potential buyers beware. You need to make sure you'll be able to use the software before you buy this camera. If you're using Windows XP, Windows 8 or even Windows 7 32-bit, you're out of luck. You will not be able to do anything with the pictures you take with the Lytro camera if you're not running that specific version of Windows. The camera produces Lytro's proprietary LFP file, so the only option is to use the Lytro desktop application to copy files to the computer and interact with them. The main focus of this type of technology is to interact with your pictures on your computer, tablet, mobile phone or online. It is possible to export pictures to JPG format, but the resulting images are low resolution, barely over 1 megapixel. If you're into printing your pictures you won't be able to go above 5x7. This is definitely an interesting camera, and we're sure to see even more exciting developments in the light field arena in the future. Some may question the benefits of the Lytro camera compared to current digital cameras. After all, why pay $399 for it when one can get a Nikon 1 mirrorless camera for the same price, or a Polaroid iM1836 (which I reviewed in a past article). "The future is very exciting for light field photography in general and Lytro in particular," commented Adam Gould / Lytro Support. "Just remember that this is our first product, and the very first light camera, ever. Think back to the 90's when digital first hit the scene. 95% of photographers at the time laughed and couldn't understand why anyone would pay that much for so little functionality. But it was a start, and now digital is pervasive." Ten years from now we may look back and wonder how we ever contented ourselves with plain vanilla 2-D pictures. Billionth iPhone App is a Freebie!